The US issued an advisory on Monday warning businesses about North Korea’s sanctions evasion tactics, ramping up pressure on the reclusive country amid a lack of progress on denuclearization talks. The Departments of State, the Treasury and Homeland Security put out the advisory aimed at protecting manufacturers, buyers and service providers from the risk of violating US and UN sanctions on North Korea. The advisory does not add any new sanctions against Pyongyang, but appears to reflect the Trump administration’s determination to maintain maximum pressure against North Korea through sanctions until it completely denuclearizes. The advisory listed cases of possible sanctions violations, names of 42 countries where North Korean laborers illegally earned foreign currency and penalties for violations of sanctions. In the annex, it also listed joint ventures that have operated in North Korea. “Businesses should be aware of deceptive practices employed by North Korea in order to implement effective due diligence policies, procedures, and internal controls to ensure compliance with applicable legal requirements across their entire supply chains,” according to the 17-page document. Seoul’s Foreign Ministry said it views Washington’s move as reaffirming its position that sanctions should be strictly implemented to lead the North to denuclearize. “The South Korean government is closely communicating and cooperating with the US government on various levels, and regarding the implementation of sanctions on North Korea, we are maintaining close coordination with the US,” the ministry’s spokesman Noh Kyu-duk said at a press briefing Tuesday. It is not the first time the US has put out such an advisory. In February, the State Department issued an advisory explaining deceptive shipping practices used by North Korea to dodge sanctions, including altering vessel identification, ship-to-ship transfers, falsifying cargo and disabling identification systems. Monday’s advisory, however, comes amid growing worries over a possible crack in the international sanctions regime, following a June 12 summit between the US and North Korea in Singapore. 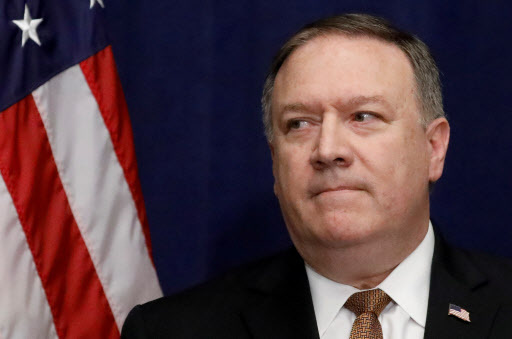 On Friday, US Secretary of State Mike Pompeo urged Russia and China to clamp down on repeated breaches of the oil sanctions regime on North Korea at the UN headquarters in New York, saying “strict enforcement of sanctions” is critical to achieving the goal of North Korea’s denuclearization. He said the US had evidence of at least 89 illegal ship-to-ship oil transfers this year. Against the backdrop of continued efforts to denuclearize North Korea, Mark Lambert, the US State Department’s Korean desk director and acting deputy assistant secretary, is set to visit South Korea on Wednesday and Thursday. Lambert, who is part of the US’ working group to follow up on denuclearization talks with North Korea, plans to meet Foreign Ministry officials in charge of North American affairs and North Korean nuclear issue to discuss North Korea and other issues, according to the Foreign Ministry. The senior official will also reportedly hold a roundtable meeting with South Korean businesspeople involved in inter-Korean economic projects to explain to them the US’ stance on sanctions against the North. His visit comes amid reports that two ships carried North Korean coal to South Korean ports in October last year in violation of United Nations sanctions and had avoided punishment. The South Korean government said it is still investigating the case. Separately, South Korea has requested an exception to sanctions on North Korea to the UN Security Council as part of efforts to promote inter-Korean exchanges. Foreign Minister Kang Kyung-wha stressed the need for a partial sanctions lift in areas needed for cross-border projects.